Luci Tapahonso is originally from Shiprock, New Mexico and is a Professor of American Indian Studies and English at the University of Arizona in Tucson. She is the author of three children’s books and five books of poetry including Blue Horses Rush In, which was awarded the Mountain and Plains Booksellers Association’s 1998 Award for Poetry. 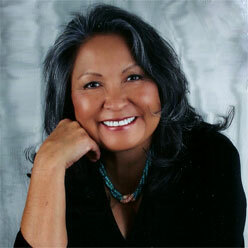 Professor Tapahonso received the 2006 “Lifetime Achievement” award from the Native Writers Circle of the Americas. Her forthcoming book, “A Radiant Curve” is due in mid-2007 and is in publication at the University of Arizona Press. She is recipient of a number of other awards including The 1998 Kansas Governor’s Art Award, and Distinguished Woman awards from the National Association of Women in Education and the Girl Scout Council of America. The Native Writers Circle of the Americas named Tapahonso the 1999 “Storyteller of the Year.” She is most honored by being asked to serve as Grand Marshal for the Northern Navajo Fair Parade in 1991 and 1999 in her home community of Shiprock, New Mexico. "They Lived Here" and "The Round Roof Hooghan"
Broadside created by Paul Hunter/Wood Works Press for the poet�s reading for Counterbalance Poetry on Wednesday, April 11, 2007. Printed from hand-set metal type on archival paper with original woodcut. Limited to 160 copies.